Last month I wrote about a BBC article that describes a bold claim from Dr. Quentin Atkinson. This claim is that the Indoeuropean language (from which English and many other major word languages descended) came from modern day Turkey, not the Caucus region. The new theory is based on the results of a computer program that is normally used to show how related the DNA from different species is. Evolution is certainly a buzz word. It has a halo effect that seems to add legitimacy to what a person says. Because of this people apply the word to situations that I often find strange. An actor’s career evolves even though it doesn’t give birth to new acting careers? Another tangible difference between the evolution of a career and the evolution of, say, chihuahuas, is that human beings have free will and the animals facing extinction did not. Rob Schneider is an example of this. A successful comedic actor, when asked if he would consider a dramatic role, he replied, People don’t ask Andre Agassi, ‘You know you’re the No. 1 tennis player in the world … have you thought about polo?’ Rob’s career has faced the gamut of stimuli: everything from being extremely popular to almost forgotten. Through it all he sticks to comedy. Why? Choice. It’s true that outside factors are important. Some actors change out of perceived necessity and others change because they are famous and think they can get away with a different type of role. Though there are many outside factors there is one internal factor that can completely invalidate all others: free will. When it comes to human beings, their perception and interpretation of their experiences is much more important than the experiences themselves. At the moment, Croatian and Serbian are mutually intelligible. Contrary to the trends of most other languages, Serbian and Croatian may no longer be mutually intelligible after 100 years or so. The reason for this is Croats are taking words of non-Slavic origin, inventing new replacement words of Slavic origin, and trying to phase the old words out. In Croatian the word for university is sveučilište. When you break down the different elements of the word it means the same thing as university (place of all knowledge/learning) but uses Slavic morphemes instead of Latin ones. The word in Serbian is yниверзитет (univerzitet). If the Croats continue this trend then their language will eventually cease to be understood by Serbs, Bosnians, Bosniaks and Montenegrins. One could argue that this is evidence of linguistic evolution since Croats could feel threatened by the Serbian language. This argument has dubious merits but let’s consider it for a moment. Does it explain the way other mutually intelligible languages in similar circumstances have changed or not changed? Norwegian, Danish and Swedish are mutually intelligible but are not giving way to each other, in spite of Norway historically losing its statehood from time to time to the other two countries. Laotian, Isan and Thai are another example of mutually intelligible languages that have not made significant efforts to distinguish themselves in spite of conflict between their speakers. People make the difference; their perceptions make the difference. Basque and Welsh should have disappeared long ago but they haven’t and probably won’t. Hebrew was resurrected from the dead! On the other hand, Dutch, Mongolian, German and Turkish were militarily and economically dominant languages that have left a proportionately tiny linguistic impact on the world. This is why I can’t accept a purely evolutionary explanation for a quintessentially human driven phenomenon. A physicist lives in a world of relative certainties; a psychologist does not. She may be able to predict with as much as 80% accuracy how different people will react to different things but, in the end, she will never know for sure. 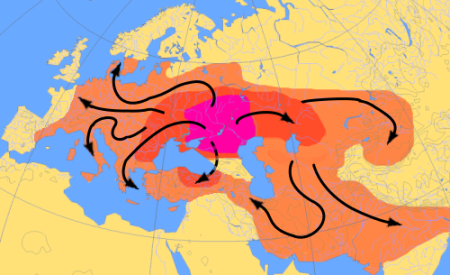 This theory that Indoeuropean came from Turkey may possibly be better than the one that claims that it came from the Caucuses. This, however, would only be so if the latter theory were slightly better than a wild guess. This recent BBC article highlights the work of Kiwi researcher Dr. Quentin Atkinson on the origin of Indoeuropean. This is a language that we actually know very little about but many of the world’s major languages are derived from it (see the map below). 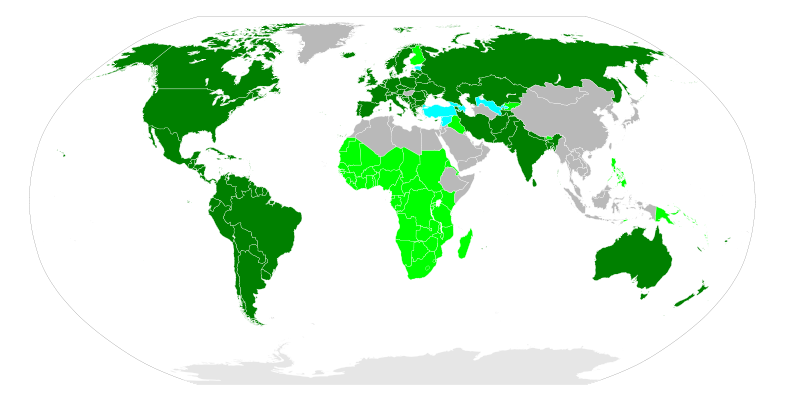 The green countries mainly speak languages that descend from Indoeuropean, the neon green ones have an Indoeuropean language as their official language (or an official language) but actually have multilingual societies, and the turquoise ones have large minorities that speak an Indoeuropean language. My friend Vlad (over at Forever a Student) has been attempting to learn Persian/Farsi. He speaks eleven languages, some of them with a near native level of mastery. Most of his languages are Indoeuropean: English, Italian, Slovak, French, Russian, German, Czech, Spanish, German and Portuguese. He also speaks two that are not Indoeuropean quite well (Mandarin Chinese and Hungarian). The man can’t help but be a philologist! Here are some examples of connections that he’s made between his different Indoeuropean languages and his newest Indoeuropean language: Persian. All of these languages must have had a common source. We call that source Indoeuropean even though we have no idea who the Indoeuropeans were, what they actually called themselves or even exactly how their language worked. The modern language that is closest to the original Indoeuropean is supposed to be Lithuanian. What scientists have commonly suspected is that, after the wheel was invented, the Indoeuropeans left their home in the Caucuses (see below) and went all over the place. Dr. Atkinson applied technology that shows the level of commonality in the DNA in different organisms to languages. This apparently was done with a huge data base of cognates. His results led him to believe that Indoeurpean does not come from the Caucuses but from Turkey. What do you think of this idea? Do languages change the same way that organisms evolve? Does it matter where Indoeuropean originated? Click on the link below to listen to our latest podcast. 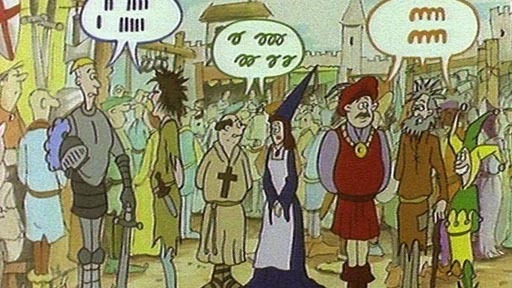 My favorite character in the children’s story The Emperor’s New Clothes is the child who states the obvious. I suppose if that kid grew up and studied languages, s/he would ask why Serbs and Croats say they speak different languages even though they understand each other just fine and why Chinese is considered one language even though a ten-year-old from Hong Kong and a ten-year-old from Shanghai couldn’t communicate well enough to say who their favorite soccer players were and why. Ever since I was introduced to the fact that the terms dialect and language had very weak definitions I have pondered on possibly better ways to address differences in speech. If all languages were as different as Cambodian and Turkish, or Japanese and Swahili, we would have no problems distinguishing between a dialect and a language. A dialect would be a variation of a language that all other speakers of that language could mostly, if not entirely, understand; a language would be considered different when the speakers of one group could not understand the speakers from another group. These definitions have two major problems. One problem is that rulers have called mutually intelligible ways of speaking different languages to try and solidify their control and separate their subjects from others. They also do the reverse, calling mutually unintelligible ways of speaking the dialects of one national language for to solidify their control and unite different people who might not consider themselves unified. Over time these decisions have become ingrained in issues of national pride, religious unity, ethnicity, tradition, etc. The second problem comes from dialect continua. In a nutshell, people living village A understand the people in village B just fine. People from village B and village C understand each other well but people from village A have a hard time communicating with village C and vice versa. People from village D understand people from village C quite well but have difficulty understanding villagers from B and can’t really understand the people from A. Examples of dialect continua include the varieties of Hindi, Chinese, Arabic, German and the main Scandinavian languages. The trouble is that everyone in the language group is understood by someone else but very few are understood by everyone. I will be writing more about this fascinating subject in the future but for right now I would like to leave you with my basic proposal for changing how we call different linguistic varieties. My ideas are not fully fleshed out but I think they are a good start and I would appreciate your opinions about how to improve upon them. I would also like to clearly state right here that I am not interesting in the comments of naysayers. I don’t mind people disagreeing with certain points or, better yet, making helpful suggestions – even if I don’t end up agreeing with them – but I am not interested in hearing from those who think that this is a pointless or impossible endeavor. My new approach to looking at linguistic varieties, as of now, is based on two principles and three definitions. Dialect – A spoken variety of which roughly 80% can be understood by the speakers of another dialect with little effort or less than a few days of constant exposure. Sister Language – A spoken variety of which roughly 65% can be understood by the speakers of another sister language but that can be learned very quickly through systematic study or by a week to a month’s worth of constant exposure. Language – A variety of speech that is less than 50% intelligible by speakers of other languages and cannot be learned without months or years of systematic study or constant exposure. Perspective – The designation of dialect, sister language or language changes depending on the perspective of the speaker or groups of speakers. Self-determination – While these new definitions would be very useful in academic or scientific settings no steps should be taken to force linguistic groups to conform or change the terms they use in everyday life or government. I’ll end by referencing my very first post, which was about this subject. The comedian Robbin Williams has a part of a stand-up routine where he muses over how unintelligible the Scots are to the rest of us English speakers. Saturday Night Live was hosted by Gerard Butler not too long ago and they did a funny sketch where a newscaster “interpreted” for the Scottish actor. I have a good Argentine friend who has lived in the USA for quite some time and has had to modify his accent and pronunciation significantly to communicate well with the Chicanos in California. These are supposed to be people speaking the same language yet there are Laotians and Thais, Swedes and Norwegians, and Croatians and Serbs who speak to each other in their own languages freely and understand 80%-90% of what the other is saying. Dr. Arguelles just conducted a great interview with a Laotian (really Isan)/Thai speaker about how mutually intelligible the two languages are. I invite you to take a look. I’m sorry. I’m too annoyed to understand what you’re saying. Sometimes we don’t understand a language/dialect because we associate it with offensive or irritating people. This is often the case with a sophisticated city accent and a provincial or country accent. I think most of this ends up having to do with our attitudes because I have seen people in the states with very regional accents have long conversations with pretty foreign exchange students whose English was halting. There is also the example of a friend of mine who passed for a Japanese person on the phone and then met with the Japanese person who swore that he could barely understand my friend and wanted to speak to the Japanese person he had talked on the phone with. I suppose what we can take from this is to have a good attitude when trying to understand others. Having a good attitude seems to clear the mind and facilitate communication. Not judging others for their way of speaking may just help you understand a foreign language better. The British comedian Eddie Izzard once said that Great Britain built up her empire with the cunning use of flags. I thought this over simplification was not only pretty funny but that it also had a ring of truth to it. Thinking it over myself, I also found that many nations seemed to have built themselves up by defining their languages. Can I be a German if I don’t speak German; can I be an Egyptian if I don’t speak Egyptian Arabic? Are nations really defined by the languages they speak? The Latin language gave birth to a large and violent family. Many of its children, like Asturian, Occitan, Valencian, Aragonese, Dalmatian and many others, never reached full maturity. Even to this day poor Catalan, Galician and Aranese have never really recovered from the abuse of their childhood. Latin’s eldest child, Italian, has become the language of love and culture. Latin’s illegitimate child, French, has become a literary and global giant. It looked as though Portuguese might end up as the runt of the family but instead it turned out to simply be a late bloomer. The Iberian Peninsula, like the rest of Medieval Europe, was dived into many tiny countries whose boundaries were always changing after small wars. By today’s standards, we would say that most of these countries all spoke dialects since their languages didn’t really have much of a written standard. Most things worth writing were written in Latin. In 1290 King Dennis of Portugal founded the University of Lisbon and declared that Portuguese would be the official language of his kingdom, effectively cutting short poor little Portuguese’s linguistic adolescence. The day before, everyone in Portugal was speaking a corrupted dialect of Latin but a royal decree and a university laid the foundation for Portuguese to become the language of the Bible, Camões, Fernando Pessoa and over 230 million other people living in the four quarters of the Earth. King Dennis’ foresight allowed Portuguese to survive when other little countries, and their dialects, were swallowed up by Castile and Leon and the Spanish language. Bengali is spoken by over 170 million people who live mostly in eastern India and Bangladesh. When India was about to become a nation, independent of the British, the Muslim Indians wanted to have their own country so they wouldn’t constantly be out numbered by the Hindu majority. The decision was made to form Pakistan wherever there was a Muslim majority. The problem was that there was a Muslim majority in the western and eastern extremes of India. The people in the west spoke Urdu, which is essentially Hindi written with a Perso-Arabic alphabet instead of Hindi’s Devanagari alphabet. By simply giving their writing different symbols the Indian Muslims of the west claimed to have created a new language: Urdu. Since Urdu was intrinsically associated with Indian Muslims and most of the Pakistani leaders were from the west, the new government of Pakistan decided to establish Urdu as the official language of the country. All dealings in the government, schools and media would mandatorily be in Urdu. The problem was that of the 69 million Pakistanis, 44 million lived in the east and spoke Bengali, not Urdu. This meant that 63% of the new Pakistani citizens had to watch TV and listen to the radio in a foreign language. It meant that their local town meetings as well as their national meetings would be in a foreign language and that their children not would be educated in the language spoken at home. This led to mass protests for several decades until Eastern Pakistan eventually separated itself from the rest of Pakistan and became the independent nation of Bangladesh where the official language is Bengali. Even before the ancient Jews were defeated and carried away by the Babylonians (ancient Iraqis) Hebrew was losing ground to Aramaic, which was a related language. By the time the Jews came back to their country Aramaic was the language that most of them used in everyday speech. Most scholars believe that Christ gave His sermons in Aramaic, not Hebrew. After the second century A.D. Hebrew ceased to be anyone’s native language. Most Jews ended up speaking their own dialect of German (Yiddish), Spanish (Ladino) or whatever other language they were surrounded by. Today, eighteen centuries later, it is the native language of over seven million people. How did that happen!? Hebrew wasn’t really dead but it was definitely in a coma. Luckily, the Jews acted like caring relatives and visited the language often. Most Jewish boys had to study Hebrew at an early age. Almost all religious ceremonies and rituals were conducted in Hebrew. The language was also used in rabbinical literature. As a result many Jewish people, especially men, had at least a basic grasp of Classical Hebrew. Eliezer Ben-Yehuda, an Eastern European Jew, moved to the Ottoman controlled area of Palestine and set out to revive Hebrew as a living language, convinced that it could unite the Jewish people. Since Jews from all over the world were coming to Jerusalem, some of them were already using Hebrew as a lingua franca. Ben-Yehuda and his wife spoke nothing but Hebrew to their son and even tried to shield him from the influences of any other language. They also encouraged other Jewish families to give up their native languages and speak nothing but Hebrew at home. His success was very limited until he was able to get Hebrew to become the language of instruction in public schools. Even this achievement had a rocky start. At first, several different pronunciations were being taught in different schools. A huge influx of Yiddish speaking Jewish immigrants also threatened to kill the movement. People also questioned the practicality of teaching a minority language of little economic value to their children. Yiddish has a high degree of mutual intelligibility with Standard German. Ben-Yehuda could not be dissuaded. He, and others, came up with an official Hebrew dictionary with modern terms and regularly published a Zionist newspaper entirely in Hebrew. In the end, the Israelis decided that it made more sense for them speak Hebrew than Yiddish. Israelis who commonly used any language other than Hebrew were criticized and sometimes even harassed. The phrase, “יהודי, דבר עברית (Jew, speak Hebrew).” became very common in Israel when one Israeli heard another speaking a language that was not Hebrew. The movement was successful and Hebrew has been revived after a 1,800 year long coma. In 1914, American President Theodore Roosevelt stated, “We have room for but one language in this country, and that is the English language, for we intend to see that the crucible turns our people out as Americans, of American nationality, and not as dwellers in a polyglot boarding house.” The United States has absorbed huge numbers of German, Italian, French and Spanish speakers. If Scandinavian were one language and not three, it would also count as a major language absorbed in the USA. Most children in the USA whose parents speak a language other than English at home end up having only a very passive knowledge of it and then very rarely pass it on to their children. This is the way things have always been. The huge immigration of Spanish speakers to the USA in the latter half of the 20th century and in the beginning of the 21st has created something of a phenomenon. For the first time since WWI, when the German speakers were persecuted and their schools and newspapers shut down, a language other than English has a significant presence in the USA. This issue is controversial to say the least. The US government is aggressively avoiding the issue despite what its citizens demand. Every few years it passes laws that fine people who employ or house illegal residents but these laws are almost never enforced. Twenty eight of the fifty states have declared that English is their official language but that doesn’t stop the Hispanics from speaking their native language or from having quinceañera parties. Ignorant and desperate Americans are holding raids in different parts of the country, rounding up people who have brown skin and speak English with an accent. There are even a few counties with telephone numbers to call and report illegal residents. Since the average white American is monolingual and does not know much about Hispanic culture, many legal residents are being arrested along with the illegal ones. Many Americans fear that the Hispanics will eventually do what the Bangladeshi and Portuguese did: use their linguistic separation as a precursor to creating a new nation. Indeed, the only city with more Mexicans than California’s Los Angeles is Mexico City itself. The only city with more Puerto Ricans than New York is San Juan, Puerto Rico. Americans have a situation that is similar to the Israelis’: they live in a country of immigrants where unity is facilitated by a common language. Are Americans wrong to demand that immigrants, legal or illegal, learn English and abandon their native language? Should they feel intimidated that more tortillas are sold in the USA than bread? Should they be bothered that some of their children have trouble finding part time jobs because they do not know Spanish? Should they use the situation to become a bilingual nation? Should they embrace not only Spanish but all the languages and cultures of their immigrants? Is it necessary for Americans to cling to English in order for America to continue in prosperity or is this a false perception on their part? Are Americans silly to think that Hispanics are taking over their country?